To start, I briefly run through some types of environmental impact..
From the chemicals used in cotton harvests to the waste that ends up in landfills, the life cycle of a garment typically starts and ends in pollution. Pesticides, insecticides and chemical fertilisers are used in the harvest stage of plant based materials. Production of both man-made and synthetic materials are chemically intensive and emit toxic gasses. Chemical dyes and finishers are used in the processing stages of textiles and wash into surrounding rivers affecting aquatic life and the surrounding soil. Industrial production has rendered many rivers around the world toxic and unsustainable to life (e.g. Tirupur river below which is stained purple). Polyester sheds microplastic fibres when we wash our clothes and have been found to wash up on shorelines (In fact these microplastics made up 85% of human made debris along shorelines in several places in the world). These fibres are consumed by marine life, causing growth, reproductive and digestive problems and their toxins can bioaccumulate. They can also pollute the air and we may breathe them in. Needless to say, the large amount of textile, clothing and packaging waste contributes to pollution too (only 20% of textiles are recycled). Over 70 million trees are logged every year for plant based fabrics like rayon, viscose, modal and lyocell. Forests are cleared for cotton plantations. A cotton plant takes around 30,000 litres of water to produce 1kg of cotton. and 11,000 to 20,000 litres of water to produce a pair of jeans. 132 million metric tons of coal is required to produce 60 billion kilograms of textiles. Fast fashion that was worn less than 5 times (and kept for 35 days) produced over 400% more carbon emissions per item per year than garments worn 50 times and kept for a full year. 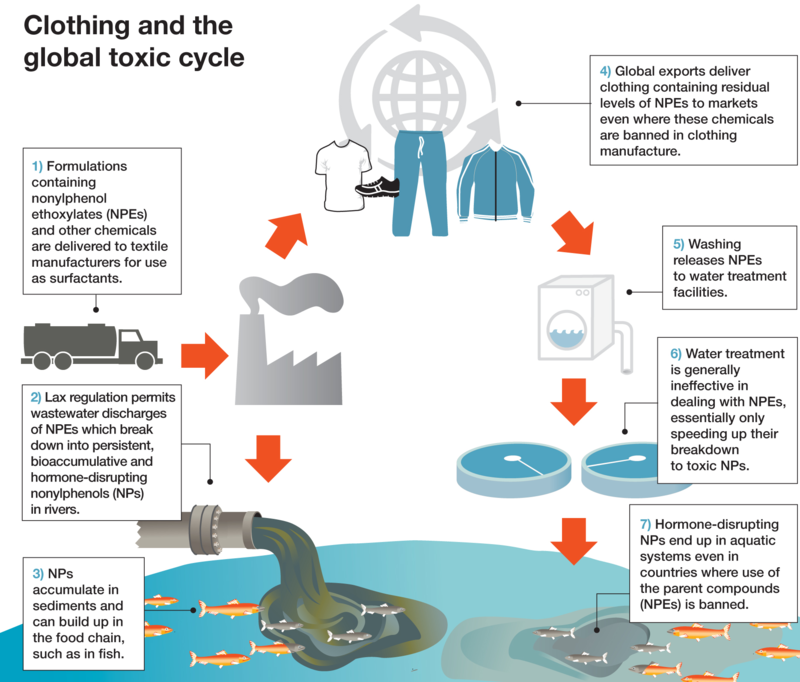 A quarter of the chemicals produced globally are used in textiles with an estimate of 8,000 synthetic chemicals used throughout the world to turn raw materials into textiles. Cotton uses 22.5% of the world’s insecticides and 10% of all pesticides, on 2.5% of the world’s agricultural land. Dying cotton usually involves compounds of iron, tin, potassium and solvent-based inks containing heavy metals.The finishing process uses chemicals like chlorine. Nonylphenol ethoxylates (NPEs) are released from our new clothes when we wash them. NPEs cause reproductive issues and is lethal to aquatic wildlife; it also contaminates our food, air and water. Nonylphenols (NPs, a derivative of NPEs) which are persistent, toxic and hormone disrupting. It can bioaccumulate in the aquatic wildlife and has recently been detected in human tissue. Phthalates- commonly found in images printed on clothing. It has been banned in certain items (in the U.S.) due to its link to cancer and endocrine disruption. Greenpeace has found toxins in garments from budget to luxury(these included Calvin Klein, H&M, Mango) and even in clothing for children and infants.